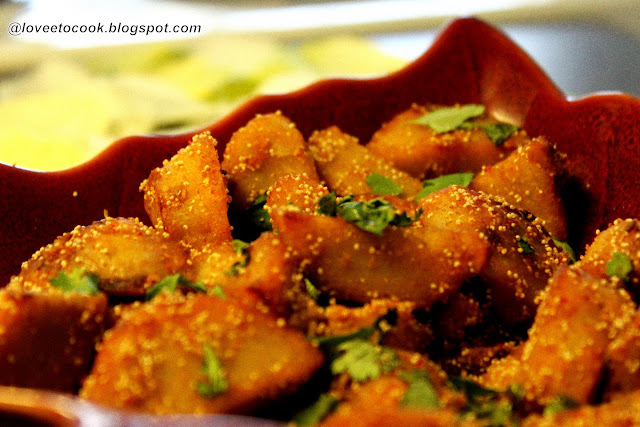 Arbi aka taro, colocasia, arvi, ghuiya- is a root vegetable. I had nightmares cooking it yrs back myself , but this ugly looking hairy knotty root that you see in most international stores is truly underrated and outshined by the likes of potatoes and yams. This is one diamond in the rough which u have to lay your hands on and then you'd be hooked to it forever. Boil arbi till a whistle in a pressure cooker. Cool, peel and dice them to bite size pieces. Dab with a tissue if the pieces are still too wet or slimy. Take a ziplock and put the pieces inside with a drizzle of oil and salt, massage very lightly to mix. Take a sheet pan and place the oiled arbi on to it , each piece at a decent distance. Bring the oven knob to a broil and place the sheet pan inside -- roast till crispy brown on all sides. Remove once done. Now take a wok , heat 2 tsp oil and add cumin seeds to splutter. Add red chilli, turmeric , coriander powders and stir . Add the broiled arbi and stir with some more salt if needed. Add drops of water to bring everything together. Finish with a generous sprinkle of poppy seeds , lemon juice and chopped cilantro. Serve hot. Another welcome addition to your happy hours, Truly finger licking!! m lovingg it ... looks delicious !! !